Description: Kigali, Rwanda, is proving to be a testing ground for whether sustainable architecture can help to offset the environmental impacts of breakneck urban development. With Africa’s population set to expand rapidly over the next century, top foreign architects are being lured to the city by comprehensive urban plans which promise a green future for millions. The question is whether this utopian vision can be realised alongside ambitious and sometimes unrestrained Chinese alternatives. In 2010, the world reached an important milestone, with the number of people living in urban spaces exceeding the global rural population for the first time. Cities, which cover less than 2% of the earth’s surface, consume almost 80% of energy worldwide, and account for more than 50% of emissions. In the fight against climate change, the urban space constitutes a key battleground. Nowhere is the need for sustainable urban development more acute than sub-Saharan Africa – one of the world’s most rapidly urbanising regions. Despite accounting for less than 10% of global emissions, the continent looks set to bear the brunt of the effects of climate change. With cities across Africa already struggling to accommodate the continent’s fast growing urban population, some are turning to innovative architecture for solutions. Kigali, the capital of Rwanda, is one such city. In its suburbs, imagine four-story apartment blocks rising up amid tree-lined boulevards, spacious courtyards and well-tended allotments. Across town, earthwork steps provide spectators with a view of a cricket oval hosting some of the world’s best teams. This depiction of the city may feel more like a vision of utopian living than a bustling East African capital. 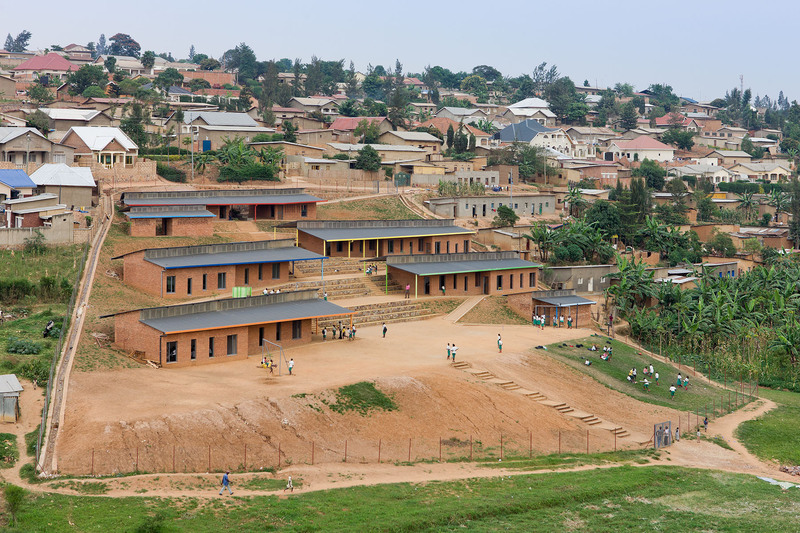 But as Rwanda grapples with the highest rates of urbanisation on the continent, foreign and local architects are being enlisted to work on ambitious projects that could provide a model of sustainable living in Africa. The need for such a trailblazer cannot be overstated. According to a new report by the Global Commission on the Economy and Climate, 22 million people are being added to African cities every year. As a result, planners and architects will play a key role in building cities – which account for the bulk of emissions and energy use globally – that avoid the pitfalls of slum expansion, decrepit infrastructure and climate-altering pollution. “The ongoing issues that cities like Lagos and Nairobi currently face are the results of early plans that took no account for an urban African future, as well as decades of planning regimes incapable of managing rapid urban growth,” says Kelly Doran, manager of East African programs at US architects MASS Design Group. That opportunity is being seized by architects attracted to the Rwandan government’s ambitious green agenda, concrete urban plans and reputation for strong policy execution. Boston-based MASS Design Group was founded in 2008 during the design process for Butaro Hospital in Burera District, and has since branched out into primary schools, doctors’ housing and neonatal units. Light Earth Designs, a firm with British and South African roots, has been in the country for over 5 years and is behind the housing and Rwanda Cricket Stadium plans. What the practices have in common, aside from their Kigali outposts, is a growing expertise in drafting sustainable solutions to Africa’s rapidly growing urban spaces. In particular, both firms stress the importance of using local construction materials to reduce landlocked Rwanda’s dependence on environmentally costly imports. “They’ve realised the home-grown approach is really important, otherwise they’re completely reliant on high-carbon, imported materials” says Tim Hall, founding partner of Light Earth Designs. Despite earlier resistance to local building materials often seen as regressive, Hall says that the government are now fully behind the drive to encourage a domestic construction industry. The impact of this locally fabricated – “lo-fab” – philosophy is already evident in Kigali’s expanding cityscape. At Umubano Primary School, a MASS Design project, local brick and papyrus reeds replace foreign-made materials in a structure designed to reduce energy consumption. Yet trading foreign materials for local alternatives is only a part of Rwanda’s grand vision. With a population projected to more than double to 26 million by 2050, environmentally considerate housing solutions will be at the forefront of efforts to avoid unrestrained sprawl and environmental degradation. Light Earth Design’s pilot project intends to show that high-density living need not replicate the conditions experienced by people living in slums across the world, but can incorporate gardens, water retention technology and active energy production. “We’re addressing the issue of the densest population in Africa per kilometre with limited land, most of it sloping, and how you condition the first generation urban population to live at a higher density in excess of 100 units per hectare instead of your own dwelling,” says founding partner Peter Rich. Such ambitious developments will require more than the commitment of prize-winning architects to really take off. Hall concedes that the sector is “tough to make money” in, while MASS Design relies on largely philanthropic funding from a range of sources. And with Sub-Saharan’s Africa’s infrastructure needs estimates at some $93bn per year over the next decade, funds for transformative urban development are likely to be keenly fought over. The question remains whether such schemes are viable on a mass scale. Alex Mulisa, coordinator at FONERWA, Rwanda’s fund for the environment and climate change, says that much will depend on the success of the pilot projects. If Kigali’s green neighbourhood proves a workable model, it could be rolled out in six other urban areas. “I believe if we have the right kinds of plans that are convincing, we can go to the World Bank and other sources. Its more to do with the extent to which we are committed to achieving our goals,” he says. For Light Earth’s Hall, that ambition in the face of limited resources provides reasons to be optimistic about Rwanda’s urban future – and the role of this small African city in the fight against climate change. “There’s a masterplan which is not flawless – like anywhere – but there’s a series of incredibly committed and talented people in a planning office that’s probably the size of a small borough in England grappling and dealing with huge issues. Show me (another) African country where they’re doing this,” he says. En 2010, le monde a passé une étape importante puisque le nombre d’habitants des zones urbaines a dépassé pour la première fois la population rurale. Les villes, qui représentent moins de 2% de la surface de la planète, consomment presque 80% de l’énergie planétaire et sont responsables de plus de 50% des émissions de gaz à effet de serre. Dans la lutte contre le changement climatique, l’espace urbain représente un champ de bataille crucial. La nécessité d’un développement urbain en accord avec le développement durable est plus urgente en Afrique subsaharienne que partout ailleurs dans le monde. Il s’agit en effet de l’une des zones avec la croissance urbaine la plus rapide au monde. Alors qu’il est responsable de moins de 10% des émissions de gaz à effet de serre de la planète, ce continent va devoir faire les frais des effets causés par le changement climatique. Tandis que certaines villes d’Afrique ont déjà commencé à lutter pour s’adapter à la croissance rapide de la population urbaine du continent, d’autres cherchent des solutions dans l’architecture innovante. Kigali, la capitale du Rwanda, fait partie de ces villes. Imaginez dans sa banlieue des immeubles de quatre étages qui s’élèvent au milieu de boulevards bordés d’arbres, des cours spacieuses et des lotissements bien entretenus. À l’autre bout de la ville, des marches en terrassement permettent aux spectateurs de voir un stade de cricket accueillant les meilleures équipes du monde. Ce portrait de la ville peut sembler plus proche d’une vision utopique de l’existence que d’une capitale africaine en pleine agitation. Bien que le Rwanda se heurte aux taux d’urbanisation les plus élevés du continent, des architectes étrangers et rwandais sont recrutés pour travailler sur des projets ambitieux visant à offrir un modèle de vie en accord avec le développement durable en Afrique. La nécessité d’un tel pionnier est fondamentale. Selon un nouveau rapport de la Commission Mondiale sur l’Économie et le Climat, les villes africaines comptent 22 millions d’habitants en plus chaque année. Par conséquent, les urbanistes et architectes vont jouer un rôle décisif dans la construction de villes, celles-ci étant à l’origine de la majeure partie des émissions et de la consommation énergétique au niveau mondial, capables d’éviter le piège de l’expansion des bidonvilles, des infrastructures délabrées et de la pollution responsable du changement climatique. “Les problèmes auxquels des villes comme Lagos et Nairobi sont actuellement confrontées résultent de planifications antérieures qui n’ont pas pris en considération un avenir urbain africain, mais aussi de plusieurs décennies de dispositifs organisationnels incapables de gérer toute croissance urbaine rapide,” déclare Kelly Doran, responsable de programmes pour l’Afrique de l’Est au sein des architectes américains de MASS Design Group. Une opportunité que saisissent des architectes attirés par l’agenda écologique ambitieux du gouvernement rwandais, des plans urbains concrets et une réputation de mise en œuvre de politiques solides. Basé à Boston, MASS Design Group a été fondé en 2008 lorsque l’Hôpital de Buraro dans le district de Burera était encore en phase de conception et s’est depuis diversifié pour travailler sur des écoles primaires, maisons de médecins et unités néonatales. Light Earth Designs, un cabinet d’origine britannique et sud-africaine, est présent dans le pays depuis plus de 5 ans et a conçu les plans de logements et du Rwanda Cricket Stadium. Au-delà de leur avant-poste à Kigali, ces deux cabinets ont en commun une expertise de plus en plus affûtée dans la conception de solutions durables pour les espaces urbains africains à la croissance rapide. Ils insistent en particulier sur la nécessité d’utiliser des matériaux de construction rwandais afin de réduire la dépendance de ce pays sans accès à la mer vis-à-vis d’importations lourdes de conséquences sur l’environnement. “Ils ont compris à quel point une approche nationale était importante, sans quoi ils dépendent complètement de matières importées à forte teneur en carbone ” explique Tim Hall, co-fondateur de Light Earth Designs. Malgré certaines réticences précédentes vis-à-vis des matériaux de construction rwandais, souvent perçus comme rétrogrades, T. Hall précise que le gouvernement est désormais bien déterminé à promouvoir une industrie du bâtiment nationale. Cette philosophie de la “construction rwandaise” se matérialise déjà au niveau du paysage urbain grandissant de Kigali. À l’École primaire d’Umubano, un projet de MASS Design, les briques d’origine rwandaise et les roseaux de papyrus remplacent les matériaux fabriqués à l’étranger au sein d’une structure conçue pour réduire la consommation énergétique. Pourtant cette substitution des matières fabriquées à l’étranger par des alternatives rwandaises ne représente qu’une partie de la grande vision du pays. Avec une population qui devrait plus que doubler pour passer à 26 millions d’ici 2050, les solutions pour des logements soucieux de l’environnement seront au premier plan des efforts destinés à éviter une extension non contenue et une dégradation environnementale. Le projet pilote de Light Earth Design a pour objectif de montrer que les zones d’habitation très densément peuplées n’obligent pas forcément à reproduire les conditions dans lesquelles vivent les habitants des bidonvilles du monde entier, mais peuvent inclurent des jardins, des techniques de rétention des eaux et une production active d’énergie. “Nous devons faire face au problème de la population la plus dense d’Afrique au kilomètre avec des terres limitées, en pente pour la plupart, et de la prise en compte de la première génération d’urbains qui vit au sein d’une densité supérieure à 100 unités par hectares au lieu de leur propre habitation,” déclare le co-fondateur Peter Rich. Pour que des développements aussi ambitieux décollent véritablement, il faudra bien plus que l’engagement de quelques architectes primés. T. Hall reconnaît qu’il est “difficile de gagner de l’argent” dans ce secteur. C’est pourquoi MASS Design dépend de financements en grande partie philanthropiques de sources multiples. Les besoins en infrastructures de l’Afrique subsaharienne étant estimés à 93 dollars par an pour les dix prochaines années, une lutte intense est à prévoir en vue de l’obtention des fonds pour la transformation urbaine. Reste à savoir si de tels schémas sont viables à grande échelle. Selon Alex Mulisa, coordinateur chez FONERWA, le Fonds rwandais pour l’Environnement et le Changement climatique, tout va largement dépendre du succès des projets pilotes. Si le quartier écologique de Kigali s’avère être un modèle réalisable, il pourrait être lancé dans six autres zones urbaines. “Je pense que si nous avons les bons plans et qu’ils sont convaincants, nous pouvons démarcher la Banque mondiale ainsi que d’autres sources. Cela a plus à voir avec le degré auquel nous sommes impliqués pour atteindre nos objectifs,” précise-t-il. Pour T. Hall de Light Earth, cette ambition face aux ressources limitées donne de bonnes raisons d’être optimiste pour l’avenir urbain du Rwanda et le rôle de cette petite ville africaine dans la lutte contre le changement climatique. “Comme partout, le schéma directeur n’est pas parfait, mais il y a un certain nombre de gens extrêmement investis et talentueux dans un bureau de planification, sûrement aussi grand qu’un petit quartier en Angleterre, qui prennent à bras le corps des difficultés considérables. Il n’y a pas un seul (autre) pays africain où cela existe,” conclut-il.